Perfect way to explore the Northern Patagonia of Chile & Argentina and link together the two countries during a longer trip. Explore the cultures of Chile and Argentina and be amazed by dramatic landscapes while cruising across the Andes by boat and bus. This relaxed itinerary takes you from the traditional cultures of Chiloe Island to the fashionable shops of Bariloche, revealing the best of Southern Chile and Argentina. Arrive to Puerto Montt and transfer to Puerto Varas on the shores of Lago Llanquihue. Explore quaint Frutillar in the afternoon, with visits to the colonial museum and a traditional teahouse. After ferrying to the mystical island of Chiloe, visit the markets and main square of Ancud and stop in rural Caulin for an oyster tasting. Continuing to the Pacific Coast, board a traditional fishing boat and motor around a small group of islands home to penguins, sea lions, otters and many bird species. Driving along the lake, enter Vicente Perez National Park and see volcanically-formed, emerald waterfalls as well as sweeping vistas to the Osorno Volcano. Continuing deeper into the park, take a motor yacht cruise to a beautiful lodge on the shores of Lago Todos los Santos. *Choose from optional activities such as fly fishing and hiking. Continuing your cruise through the Andes, watch for wildlife as you appreciate the many cascades and verdant temperate rainforest bordering the turquoise lakes. Cross over the Andes and take another breathtaking boat ride arriving to Bariloche, Argentina for a relaxing evening. Explore the many sights and natural wonders of Argentina’s Seven Lakes District. Wander Bariloche and visit streetside chocolate shops and cafes in the afternoon, appreciating the cultural differences on this side of the Andes. Walk an extensive trail of boardwalks in an old-growth arrayan forest. Continue exploring the historic Quetrihue peninsula before returning to Bariloche where your trip ends. This relaxed itinerary features a marvelous journey through the Andes Mountains via a chain of glacial lakes. The trip pairs Chile and Argentina, the Lakes District and the Patagonia, and natural and urban settings. 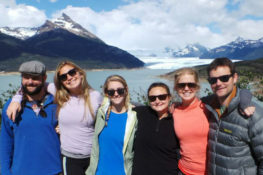 Knowmad has vast knowledge and operations in Chile; this is a private trip and we are happy to modify excursions, accommodations, and the flow of the itinerary to perfectly suit your travel style and interests. LIGHT TRIP Activities include hiking, boating, wildlife viewing & cultural opportunities. *Optional fly fishing. REGIONAL Regional airfare from Santiago to Puerto Montt averages $150, and from Bariloche to Buenos Aires averages $250. The Southern Hemisphere the seasons and climate are reversed from those in the Northern Hemisphere. While the United States and Europe are experiencing winter, in Chile it is summer. Patagonian weather is unpredictable. Expect sunshine as well as some rainy, windy South Pacific weather. The average temperature in this region from October through April is about 55 °F. Please also note that some of the activities are weather dependent. Please note that some of the activities are weather dependent. Patagonian weather is unpredictable. Expect sunshine as well as some rainy, windy South Atlantic weather. Bike from vineyard to vineyard on gentle country roads, tour the cellars, taste fine wines, eat gourmet cuisine and stay in charming boutique hotels. With premier wine growing valleys just an hour from Santiago, a few days in wine country is an ideal extension to your adventure and a good example of the diversity of landscapes and lifestyles within Chile. Looking for unique? Earth’s closest thing to Mars, Atacama will not disappoint. Your trip to this surreal landscape offers countless cultural and adventure excursions to choose from during the day, while spending nights in a true oasis, the Tierra Atacama boutique hotel and spa. Return for a dip in the pool and enjoy a local cabernet with gourmet cuisine. Don’t forget to take advantage of the world’s best moonscape and stargazing. A tropical paradise with history, culture and mystery at every beautiful turn, a visit to Easter Island – the world’s most isolated speck of land – will captivate any traveler. Meander through the picturesque countryside dotted with volcanoes, and learn about the mysterious Moai statues erected by the original Polynesian tribes who inhabited the island. Still today little is known about the statues or their creators. While circumnavigating the island on visits to the diverse Moai sites, you’ll have opportunities to relax on deserted, white-sand beaches, explore volcanic caves with petroglyphs and walk the rim of a seaside volcano.